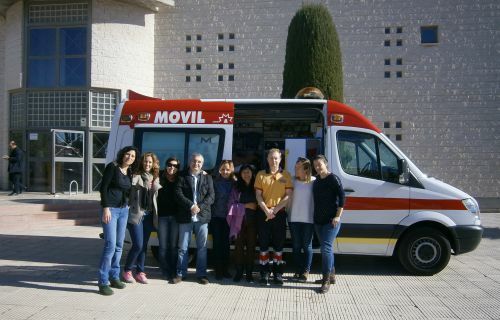 Alicante, 24 February 2015 – Researchers at the University of Alicante Nursing Department have carried out a project to achieve successful endotracheal intubation in a moving ambulance. With the collaboration of ASV Transporte Sanitario Ayuda, a group based in the province of Alicante, and the firm Medical Simulator-Innovación en Educación, they are assessing the possibility to safely assist patients in medical vehicles at all times by performing certain procedures, such as intubation. Their project, based on intubation in a moving ambulance while preserving the patient’s safety was born as a result of the need of quick and safety airway emergency management in the assistance of critical patients. These situations pose a challenge to health professionals as these involve their ability, the patient clinical conditions and, finally, the scenario they find. Sometimes complications may arise during the patient transportation which requires a rapid emergency action aimed at diffusing and securing the airway. In this sense, the study shows how this technique is suitable and safe when it comes to hostile or violent scenarios as war zones, terrorist attacks, fires, road traffic accidents involving dangerous substances and/or risk of explosion, in which the vehicle can not be stopped. According to Mª Elena Castejón, associate lecturer at the Nursing Department and main researcher of the project, the goal is to verify that intubation can be performed in a moving ambulance if strictly necessary to monitor the clinical course of a patient in critical condition. This is the first randomised clinical trial using as a research tool a high-fidelity simulation mannequin with a physiological response as a human being, a medical vehicle and volunteering healthcare practitioners from the Alicante Health Emergency Service (SES). The project based on intubation on a moving ambulance while preserving the patient’s safety (Spanish title: “¿Es posible intubar en movimiento preservando la seguridad del paciente?” is part of the doctoral studies by Mª Elena Castejón. The first phase of this project started in 2012 as a pilot study and was then published on the journal Prehospital Emergency Care (Spanish edition, 2014), and was presented in the 6th Annual UK Simulation in Nursing Education Conference at the Leeds Metropolitan University in 2012.